It is hard to believe that 2016 is over and we are reporting our dividend income results for December. Overall, 2016 was a great year for building our dividend income stream. Each month of the year we saw growth in our portfolio. We also were able to invest over $10,000 of new money into the stock market. That was less than we had hoped, but still a great accomplishment for our family. These new investments will eventually grow and compound, just like those from last year and the year before. 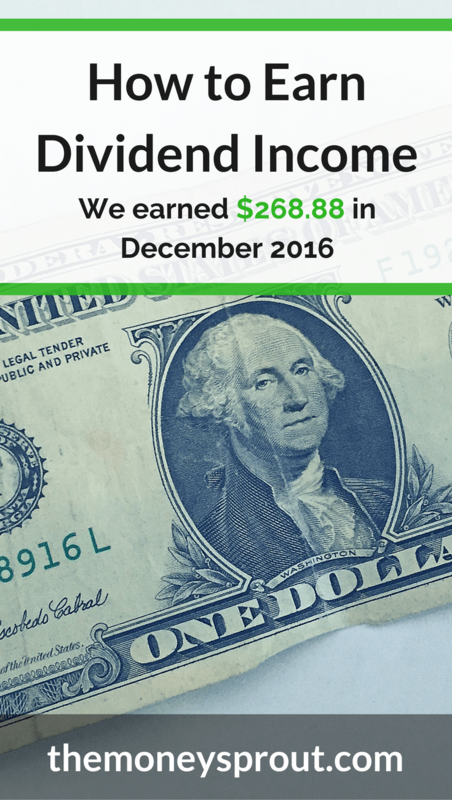 To wrap up the year, I wanted to take the time to post our latest dividend income results. I find this to be helpful as it shows the small steps we are taking in building this income stream. Since we are not loaded with unlimited cash to invest, my wife and I simply invest what we can one month at a time. As you can see below, consistently investing and growing your portfolio will provide awesome returns over the course of several years. The month of December is probably my favorite month for reporting dividend income. It often sets a new record for dividend income, despite falling just short this year. 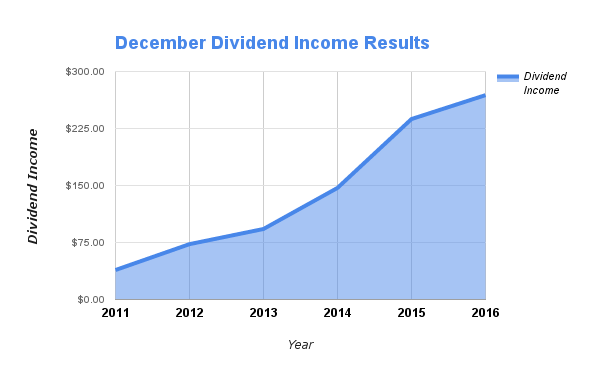 And obviously … December closes out the calendar year and gives us a picture of our annual dividend income. While no records were broke this past month, it was still the best December we have ever recorded for dividends. Our income grew by over 13% from the same month last year. I had originally figured we would set a new all time record in December, but forgot that WalMart doesn’t pay a December dividend. Instead they wait until January … which threw my projections off by about $25! We saw an increase of over 13.2% last month compared to December 2015! This increase was not as high as past months where we were averaging over 20% growth. However, a double digit increase from last year is still very solid and shows real growth in the portfolio. We also got a couple raises last month. Two companies that we own – Realty Income Corp and Sysco Corp both decided to give us a raise. All we had to do to get this raise was own shares in their company! These raises won’t show up in December but will certainly be seen in 2017. Overall, we had 16 stocks pay out a dividend in December. Awesome companies like Aflac, Consolidated Edison, Johnson & Johnson, McDonalds, and Exxon Mobil gave our family a paycheck for basically not lifting a finger. How cool is that? The last two months (November and December) have been great for new investments. This increase in new investment dollars is a direct result of our goal to grow our forward annual dividend income to $3,000 by the end of 2017. 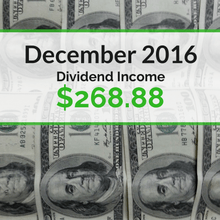 The dividend income earned in December ($268.88) was up over 13% from the same time last year. These increases were from a combination of new investments made, dividend reinvestment’s, and company dividend increases. Our goal for 2016 is to earn $2,250 in dividend income. We earned a total of $1,918.16 in dividends for 2016 … which is $330+ short of our original goal. Looking back … it seems like we overreached a bit on our goals. We probably should have set our goals about $150 less, which we still would not have hit. Ultimately, we didn’t hit our new investment targets for the year, with just under $11,000 invested in the stock market. We have major plans to bump up our investments this new year … which should help give our dividend income a big push in 2017! 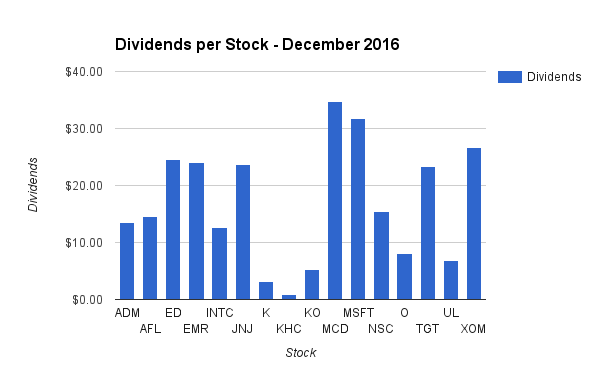 How was your dividend income in December? Full Disclosure – At the time of this writing, we owned shares in the following stocks noted in this post – AAPL, ADM, AFL, CSCO, ED, EMR, INTC, JNJ, K, KHC, KO, MCD, MSFT, NSC, O, OHI, TGT, UL and XOM. The material above is not a recommendation to buy. Please do your own research on a company before deciding to invest.